Zippered main compartment for storage of paperwork, magazine...etc. Front drop-in zipper pocket on flap, with heavy duty webbing. Elastic loops for three M4 Mags, or six pistol mags. 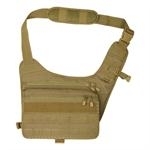 Long Bottom Compartment: (2"H x 11"W x 1"D) for tactical light, baton or pen. Color: Black and OD in stock. Tan and ACU are special order, e-mail for availability.